Everyone wants a crystal clear pool and while sanitising goes a long way towards keeping the water clean and healthy for swimmers, there is another half to the equation: filtering. But it's not just a simple matter of installing the equipment. The type of filter media chosen for the filter can make a huge difference to the quality of the water and the amount of maintenance required. Traditionally sand has been used by many pool owners for their filtration systems. Sand filtration strains the water to filter out impurities as the particles cling to the cracks of sand. Combined with the gaps between each grain this allows the particles to be trapped. Unfortunately over time these impurities eventually clog up the sand and need to be cleared every 6-8 weeks through the process of backwashing. Another drawbacks is that over time, sand can clump, calcify and create channels where water slips through unfiltered. It is generally recommended that the sand be replaced every five to eight years, as the grains eventually breakdown. 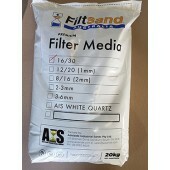 Zeolite filtration media can be used to replace sand in any sand filter. It is a high performance media, that allows the same filtration standards of Diatomaceous Earth (DE) with the convenience of sand. In addition, when you use a zeolite medium for your filter, you won't need to backwash it as often, which could be a useful time saving for you and your family. 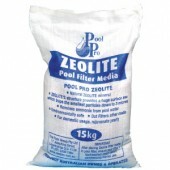 For many people, the main benefit of using zeolite is that its ability to remove ammonium ions from the water helps to keep more chlorine available, which means you don't need to shock your pool as often. Glass Pearls are one of the most effective pool filter medias available today. Glass media ensures that your system is filtering to its full capacity through electrostatic entrapment. Essentially each glass particle holds a charge that attracts the contaminants to it. It also reduces the need to backwash as much due to its unique filtration capabilities, saving you time and water. 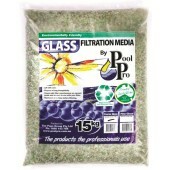 Glass media is capable of filtering water down to 3 microns. While glass is more expensive than sand to buy, it does not need to be changed as often. It may also not be compatible with all types of filters or pumps. Diatomaceous Earth is a powder made up from finely crushed coral-like rock (fossilised exoskeletons of tiny diatoms). Each grain has microscopic holes running through it to trap even the finest particles. It's added to the filter by mixing with water in a bucket and tipping the slurry into the skimmer box (with the pump running). It is sucked into the filter, forming a cake on the outside of the pad. As water passes through the pad it must also pass through the cake of DE, where filtering takes place. The DE cake drops from the pad when the pump is stopped, then reforms again when the pump is started. This type of filter media can remove particles down to approximately f5 microns in size. Care must be taken when handling diatomaceous earth, as it can cause irritation of the skin, eyes, nose, and throat, and if you breathe it in.